Held at Peterborough Town Cricket Club in August. 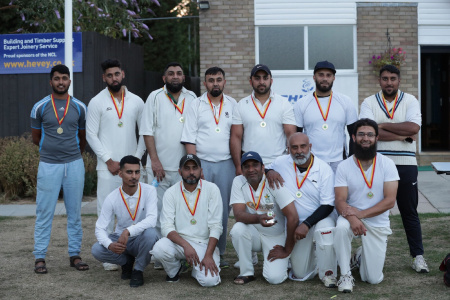 The Peterborough Midweek Cricket League Plate Final was held last week at Peterborough Town Cricket Club with supporting partner Cricket East. Shahada CC 114-9 beat Sheikh CC 83 all out. For Shahada Sports - Liaqat Ali 4 overs, 4 wickets for 14 and scored 18 runs. Waseem Ditta - 4 wickets for 16 and scored 23 runs. Liaqat Ali was man of the match: 4 for 14 and 18 runs chosen by both Captains. For Sheikh CC - Adnan Latif 4 overs, 3 wickets for 21 runs.